Cover Photo: After four years of construction, TENACIOUS began sea trials in June of 2000.
carried over 6,500 disabled sailors, including 2,687 wheelchair users. 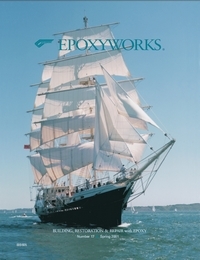 As regular readers of Epoxyworks know, WEST SYSTEM® epoxy was used throughout the building of Tenacious. Our European distributor, Wessex Resins and Adhesives, Ltd., provided epoxy products and technical support. Project Manager Howard MacKenzie-Wilson says, “the Gougeon Brothers’ development of wood-epoxy boat construction techniques, adapted for larger scale shipbuilding as they have been by the Jubilee Sailing Trust team,” can produce a cost-effective and competitive ship that requires little maintenance when compared to metal ship hulls. He believes the attention to detail in the preparation and selection of timber, the epoxy lamination techniques, and the careful quality assurance procedures used in the construction should ensure that Tenacious has a realistic working life of 100 years. Tenacious is possibly the largest wooden ship built in Britain in the 20th century. It is 213′ long, has a 37′ beam, displaces 675 tons and draws 14.7′. Designer Tony Castro carefully researched sailing ship design as far back as the 1750’s, with the clippers Thermopylae and Leander providing great inspiration. Then several hulls were computer modeled, evaluated using performance and stability computer analysis, and extensively tested in model tanks and wind tunnel. Tenacious’s hull lines, with the long keel and sectional shape not unlike a 19th century ship, offered the most sea-kindly solution. The barque rig was chosen to ensure that a mixed ability crew in watches of 10 could handle the halyards, sheets and braces without the benefit of modern geared winches. The upper yards are roller furled for ease of handling, but the course and lower topsails are rigged in traditional yards complete with footropes, stirrups and jackstays. 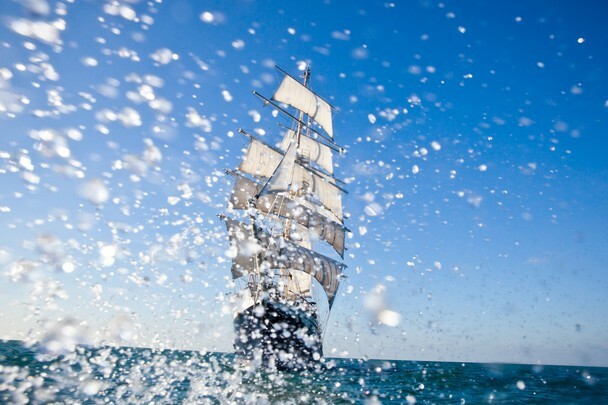 All voyage crew are involved in handling Tenacious’s 21 sails under the guidance of the professional crew. Timber was chosen for construction to allow the JST to bring its successful philosophy of integration ashore. Cold-molded, laminated, wood/epoxy construction techniques were selected to involve a broad range of skilled and unskilled, able-bodied and disabled, paid and volunteer labor in building Tenacious. Construction began in June 1996. Prefabrication of the structural components of the hull-including 114 deck beams, 69 pairs of half-frames, some 300 hanging and lodging knees, and 54 heavy wooden floors were laminated during the first year on purpose built steel lamination tables. From May 1997, these laminations were put together into immensely strong sub-assemblies known as ring frames. Then the ring frames were erected on a steel construction jig working aft from the bow. The massive stem-post and cutwater timbers were prefabricated as single units and then erected to mate with the frames. The horn timber, deadwood, stern post and stern knee were joined on the lamination table to form the massive, stern frame assembly. The prefabricated unit was joined to the structure after the frame lamination was completed. These were the biggest assemblies to be installed, each weighing nearly 3 tons at erection. The hull structure is laminated, mainly using Siberian larch from trees over 200 years old. Once the basic structure was in place, the wide upper keel structure was laminated on top of the frames, effectively forming one continuous laminated girder from the stem head to the counter. Shell lamination began in December 1997. It consists of five laminates: inner and outer skins of 25-mm thick fore and aft planks, with three 8mm diagonal veneers forming a solid core. When the shell was fully laminated onto the underside of the upper keel, it was planed off level with the bottom face. A deep lower keel section was then laminated on top of them, thus burying the shell laminates deep into the heart of an inverted “T” shaped keel section. The hull was completely sheathed with five layers of glass fabric: one layer of 8.8 oz plain woven fabric, three layers of quadriaxial 30.5 oz, followed by another layer of 8.8 oz. On the keel, all five layers were laminated at one time. Sheathing was completed within four weeks, finishing on October 15, 1998. In late October 1998, the hull was rolled and work proceeded on the interior. On February 3, 2000, the 690-ton Tenacious was loaded onto a 250′ x 78′ barge on the River Itchen in Southampton, England. Once safely on the barge and securely fixed, it was towed to Empress Dock. At 3:00 A.M. on February 4, the barge was effectively sunk to allow Tenacious to glide into the water. Towards high tide, she floated free of her cradle and was towed to Vosper Thorneycroft for stepping of the masts and final fitting out. The official naming ceremony was held on April 6. Tenacious is maneuvered by two powerful engines and is fully equipped with modern navigational aids. Tenacious also has three generators, ensuring a constant supply of electricity to heat the accommodations and supply hot water for the showers. In addition to the sleeping areas below deck, there is a saloon with a licensed bar and the lower mess where the crew enjoys three meals a day prepared in the galley by the ship’s cook. Tenacious represents a new evolution of the wooden ship. Project Manager MacKenzie-Wilson says, “the time, the economic conditions and the technology are here to build big sailing ships again.” Gougeon Brothers is proud to have helped bring the modern materials and modern construction techniques to this project. We hope as Tenacious cruises the world’s oceans, it will open up the golden age of sail to a new generation of able-bodied and disabled sailors alike. Tenacious has a busy schedule this year, with visits to Dublin, Belfast, Edinburgh, and Boston on July 29, 2001. JST is accepting applications for voyages. For further information about Tenacious’s sailing schedule and the JST, visit www.jst.org.uk. This entry was posted in Boat Construction, Yacht & Large Vessel Construction and tagged 17, cover story, Epoxyworks #17, Jubilee Trust, Kay Harley, Spring 2001, Tenacious on October 11, 2014 by ewadmin.